Strawberry Kombucha: A Delicious Probiotic Beverage! Do you miss juice or soda? 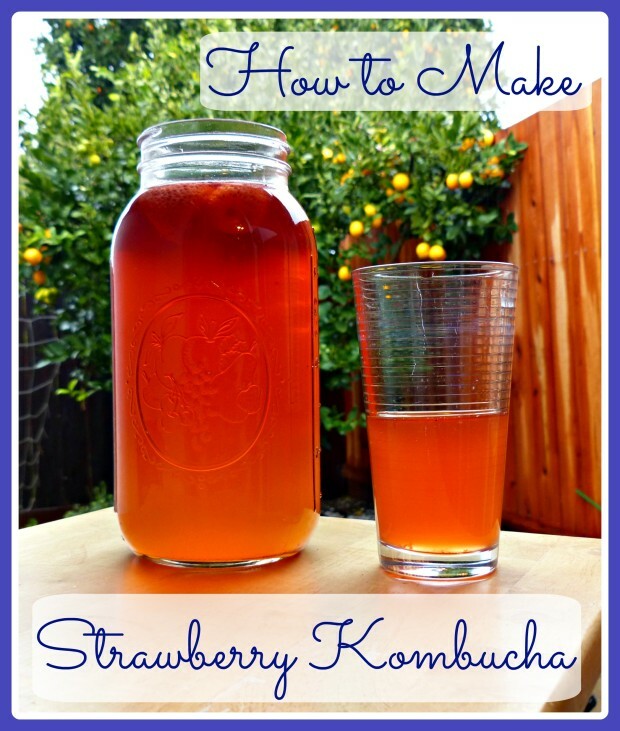 Strawberry kombucha is a delicious fermented beverage that’s actually good for you! Like all other kombucha flavors, strawberry kombucha is full of beneficial probiotics. While you can buy strawberry kombucha at the store, making your own is a great way to save money. And once you get the hang of it, making kombucha is so simple. We make a lot of our own food in my house, and making our own kombucha is one habit that saves me a ton of money while requiring a very limited time investment. First, make a batch of unflavored kombucha according to the directions in my how to make kombucha post. Depending on how sour you want your kombucha to be, this may take anywhere from 7 days to a few weeks. When your kombucha is finished fermenting, fill a half gallon jar with kombucha. Add six medium-sized strawberries. Cap tightly and store at room temperature. Enjoy your delicious strawberry kombucha! You can store it at room temperature or in the fridge. If you leave it out at room temperature, just know that it will continue to ferment and become more sour as time passes. We drink it quickly enough that this is rarely an issue in my house, but occasionally I do end up tossing the end of a bottle because it's become too tart for my tastes. You should also know that eventually a new SCOBY may start growing in your finished strawberry kombucha. This is not a problem; just discard it when you're done with the bottle, or earlier if it gets in your way. Don't use it to start a new batch of kombucha--you only want to use SCOBYs from unflavored kombucha. Looking for more healthy fermented beverage recipes? If you liked this recipe, be sure to also check out my recipes for raspberry kombucha, lemon strawberry kombucha, how to make kefir, and how to make water kefir. Do you make your own kombucha? What are your favorite flavors? 8 Responses to Strawberry Kombucha: A Delicious Probiotic Beverage! This. I will be doing this in June. Do you use frozen strawberries? Yes, I use frozen strawberries. I imagine fresh would work just as well, though! I make my own with cassis extract and some wuth mint chlorophyl . This is a great recipe! I've been trying to find some recipes for making my own kombucha at home, so I think this one definitely makes the list of ones I want to try! Thanks for sharing! Why do you have to have unflavored kombucha to start a scoby? what would happen if you use the flavored one Because I can't find a unflavored one. Can you use the strawberries after you used them for 2. fermenting - for jam or in smoothies? Hmm, I've never tried using them after fermenting. They seem pretty spent to me, but you could certainly try it!